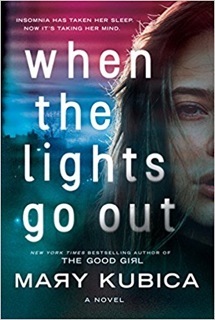 I'm the fifth stop on the TLC excerpt tour for Mary Kubica's forthcoming novel, When the Lights Go Out. (releasing Sept. 4/18) Here's the tour link with previous and forthcoming excerpts. "A woman is forced to question her own identity in this riveting and emotionally charged thriller by the blockbuster bestselling author of The Good Girl, Mary Kubica. Meanwhile, twenty years earlier and two hundred and fifty miles away, another woman’s split-second decision may hold the key to Jessie’s secret past. Has Jessie’s whole life been a lie or have her delusions gotten the best of her?" Check out the excerpt below! "Mary Kubica is the New York Times and USA Today bestselling author of The Good Girl and Pretty Baby. She holds a Bachelor of Arts degree from Miami University in Oxford, Ohio, in History and American Literature. She lives outside of Chicago with her husband and two children and enjoys photography, gardening and caring for the animals at a local shelter." You can connect with Mary on her website, likeher on Facebook and follow her on Twitter as well as on Instagram.